Cape May Brewing Company is pleased to announce that, due to consumer demand, they’ve begun packaging two of their flagship beers — Cape May IPA and Coastal Evacuation Double IPA — in aluminum cans for release on June 29. Glass bottles, long the standard in beer packaging, have slowly been overtaken in popularity industry-wide by aluminum cans. The craft beer market has determined that cans are more portable, lighter, more environmentally friendly, and keep the beer fresher for a longer period of time. Aluminum cans are a better option for beer drinkers who enjoy outdoor activities, as well. Their ease of portability make them a strong choice for hikers, campers, and other outdoors enthusiasts. CMBC prides itself on being an environmentally-conscious company. They recycle their spent grain to local farmers as feed, they source local ingredients as frequently as possible, and have constructed their current bottling line from scrap materials. Being lighter, cans require far less fossil fuels to ship. A six-pack of cans weighs about 2.5 pounds less than if that same amount of beer were in bottles, equating to a ten-pound difference in weight per case. Furthermore, according to Slate, the average American beer can contains about 40% recycled materials, while the average bottle contains about 20 to 30%. However, the energy savings when aluminum is recycled are far greater than they are for glass — 96% vs. 26.5%. Aluminum cans also supercede bottles in keeping the beer fresh. CMBC isn’t completely foregoing bottles in favor of cans. Some of their brands will continue to be bottled, including the 750ml bottles that package their highly-acclaimed Barrel Aged Series. Regardless of the benefits of aluminum cans, many consumers still associate cans with the metallic taste they remember from the 70s and 80s. Most aluminum cans are now coated on the interior with a polymer coating that eliminates the metallic flavor in the beer. Others associate canned beer with an inferior product. To the CMBC fans who feel as if they’ll miss drinking from a bottle, Henke has a simple solution. 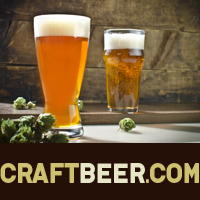 The post Cape May Brewing Company Releases 2 Flagships Beers In Cans appeared first on CraftBeer.com.